When you step into the 2019 Volvo XC40 Momentum, you’ll notice that it's been crafted with comfort and style in mind. With customization options available, you can make the XC40 your own. The front seats of the XC40 Momentum have been designed for comfort. Their ergonomic frame allows you to be less fatigued on long trips or morning commutes, and the standard leather fabric can come in a variety of color choices. The urban grid aluminum inlays at to the style of the interior and accent your color choices that are enhanced with the interior lighting. Where will you take your 2018 Volvo XC40 Momentum next? 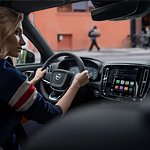 We invite you to visit our team at Volvo Cars of Evansville, where you can look at all of the features and test drive a Volvo for yourself today.